‘Hurray, boys, we’ve got them!’ General Custer reportedly told his troops before the Battle of Little Bighorn. As this shrewd, controversial book shows, military disaster comes in many forms except, in hindsight, the unexpected. 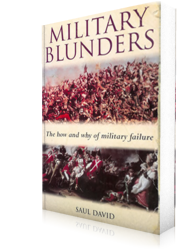 It both vividly describes some of the worst military blunders perpetrated since the birth of Christ and analyzes the psychological and tactical factors at play to show why they happened. Fascinating and informed… David’s objective snapshots leave no nationality entirely unscathed. Just the book for armchair strategists to mull over during the long winter evenings – and a timely reminder that blundering on the battlefield is no preserve of any one nation. Hilarious and horrifying. Some of the disasters described by David scale the off beat comic heights of Monty Python… A graphic account of military incompetence from Roman times to the Gulf War. No holds barred… very, very funny and at other times quite frightening.